Distribution management is Cloud ERP software that helps companies manage their supply chain and logistics activities, including warehouse management, inventory management, and order management (sales and purchase orders), and integrate these activities with the company’s financials and sales. Wholesale distribution software can help companies improve customer satisfaction, reduce order times, and control costs across the entire supply and distribution chain. Acumatica Distribution Edition includes Sales Order Management, Advanced Inventory, Requisition Management, Purchase Order Management, Warehouse Management System, and Advanced Financials. It is fully integrated with Acumatica’s CRM, Manufacturing, Field Service, and Project Accounting for visibility across the entire organization. 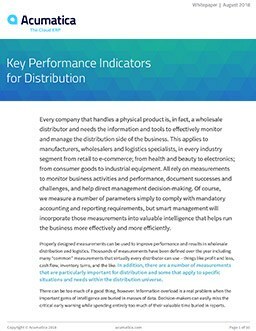 Here’s how to get started with distribution KPIs. You’ll find out how to track performance without drowning in data. Streamline distribution processes with advanced warehouse operations in receiving, inventory management and order fulfillment. Improve customer satisfaction and reduce costs with barcode scanners and mobile devices. 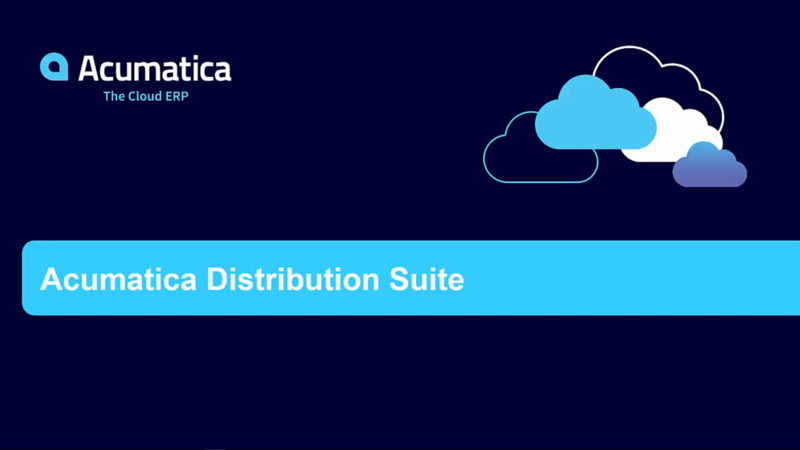 What our customers are saying about Acumatica's Distribution Management? Acumatica is incredibly simply to use, and it’s faster as well. Even though we were running Everest on premises, Acumatica is faster. The automation, the data import features and even batch change processes take minutes. Acumatica is reliable, and there’s no IT overhead. The program often crashed, and we had to restart the server every two hours...the program was struggling...it couldn’t deliver what we wanted. The fact that Acumatica offers an unlimited user license was important to us a company that’s looking to grow because it allows us to expand without having to contact the vendor and renegotiate for new users. We can just keep the business moving. Acumatica provided an accounting solution that allowed us to streamline operations, eliminate accounting costs, and process orders faster. For the first time in years, everything is reconciled and up-to-date. We were never fully reconciled with the old system. Now, with Acumatica, we can see accurate information for our whole business, it’s always up-to-date, and we only have to look in one place. Acumatica is the most mature and affordable cloud ERP system in the market with great partner support.